As a business owner, you know how important first impressions are. It’s one of the reasons you take steps to ensure your workspace, office, lobby, or restaurant looks its best every day. However, it can be difficult for your business to put its best foot forward when you’re still using outdated or worn furniture. No one wants to sit on a threadbare couch or moth-eaten armchair. Come in to discuss with one of our experts on how we can help ring your ideas to life, we are here for you from small jobs to full property overhauls. We've completed many resorts lobbies, guestrooms, common spaces in local Phoenix and Scottsdale. Instead of settling for furniture that has seen better days, explore your options for commercial upholstery in Phoenix, AZ. Turn to Imperial Custom Upholstery, LLC to learn how our team can help you refresh your business with a variety of services suitable for businesses in all kinds of industries. Let us help you keep current customers happy and appeal to potential customers later on! Why Invest in Commercial Re-Upholstery Services? Ensuring that your business offers the finest quality products and services is an important part of achieving commercial success. But the look of your business plays an equally large role, if not larger. That’s because humans are visual creatures - chances are if they like the appearance of your workspace or restaurant, they’ll want to stop in for a closer look. It comes as no surprise that keeping your business’s furniture in great condition is essential to cultivating its image. With commercial reupholstery services from our team, it’s easy to ensure your furniture appeals to customers. Whether you’re running a restaurant, medical office, or other kind of business, we guarantee you’ll notice a difference in your building’s atmosphere, as well as your clients’ satisfaction. Many different kinds of businesses offer seating for their patrons. No matter the industry you work in, you’re sure to see the effects of new commercial upholstery when you enlist our team’s assistance. 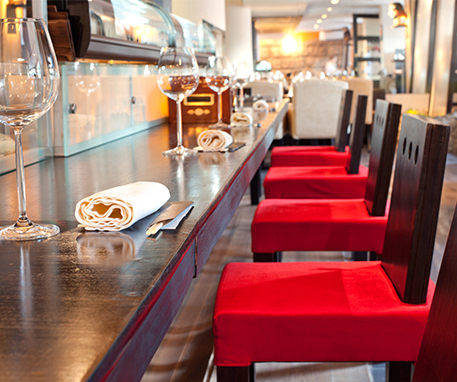 Resorts & Restaurants: No one wants to eat in a restaurant outfitted with crumbling seats. Keep your diners (and their appetites) coming with restaurant booth reupholstery handled by our team. Medical Clinics & Hospitals: Medical professionals understand the importance of sterility. In your clinic, there’s likely no room for unsightly, patchy exam tables. Upholstery and reupholstery services from our staff can help reinforce your clinic’s professional image, as well as keep your workspace tidy. Stores & Workspaces : Ensure shoppers have a comfortable, well-kept place to rest as they explore your store. Whether you carry clothing, home furnishings, or other goods, you’re sure to appeal to your patrons by offering an attractive space in which to relax and rest their feet. Contact our team to learn more about our commercial upholstery services. We proudly serve customers in Phoenix, Scottsdale, Mesa, Chandler, Gilbert, and Peoria, Arizona.